‘Gion’ (祇園) is a district of Kyoto, Japan, originally developed in the Middle Ages, in front of Yasaka Shrine. The district was built to accommodate the needs of travelers and visitors to the shrine. It eventually evolved to become one of the most exclusive and well-known geisha districts in all of Japan. The geisha in the Gion district do not refer to themselves as geisha; instead, Gion geisha use the local term geiko. While the term geisha means “artist” or “person of the arts”, the more direct term geiko means essentially “a child of the arts” or “a woman of art”. 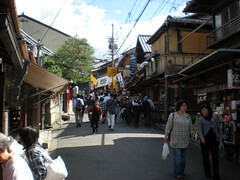 This neighborhood in Kyoto has two hanamachi (geiko communities): Gion Kōbu (祇園甲部) and Gion Higashi (祇園東). Despite the considerable decline in the number of geisha in Gion in the last one hundred years, it is still famous for the preservation of forms of traditional architecture and entertainment. Part of this district has been declared a national historical preservation district. Recently, the City of Kyoto completed a project to restore the streets of Gion, which included such plans as moving all overhead utilities underground as part of the ongoing effort to preserve the original beauty of Gion. I found this to be the most impressive area of Kyoto. Unlike Colonial Williamsburg or other similar beautifully historic areas, the Gion District is a excellently well preserved architectural museum that is still inhabited and alive with shops and restaurants as well as residences, small gardens, and a myriad of other public and private spaces. Winding through the narrow streets, one gets a profound feeling of what medieval Japan would have been like.